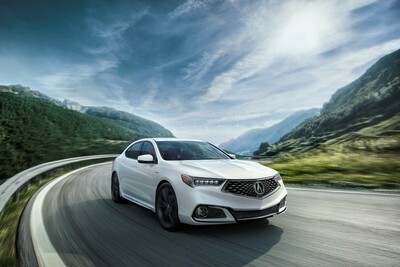 TORRANCE, Calif. Mar 29, 2019; The 2020 Acura TLX is set to begin arriving in Acura dealerships on April 2, bringing with it four new premium exterior color options. The 2020 TLX will continue to be offered with two performance-minded powertrains, an available A-Spec sport appearance package, as well as a long list of premium features including the AcuraWatch® suite of advanced safety and driver-assistive technologies, standard on every TLX. Acura's midsize performance luxury sedan is coming off a solid 2018, where TLX outpaced key competitors from BMW, Lexus, Audi and Infititi in retail sales1. For 2020, the TLX enjoys an expanded exterior color palette with four new premium paints offered for the first time on TLX. The new premium color options are: Performance Red Pearl, Majestic Black Pearl, Canyon Bronze Metallic and an A-Spec exclusive Apex Blue Pearl. These advanced paints are engineered using cutting edge pigment technologies such as micas, metal flakes and nano pigments (super-high transparency), now offered on all Acura models to deliver Precision Crafted Performance in every aspect of the vehicle. Each premium paint color receives additional coats to enhance the color intensity and depth along with a special clear coat to further improve luster. 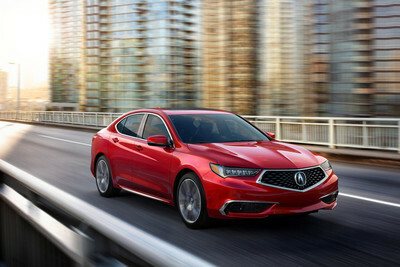 The 2020 TLX is available in one of two performance oriented powertrains: a 206-horsepower 2.4-liter i-VTEC® mated to quick-shifting 8-speed dual clutch transmission, and a 290-horsepower 3.5-liter i-VTEC® V6 paired with a 9-speed automatic. Front-wheel drive configurations of the TLX feature Precision All-Wheel Steer™ (P-AWS™) as standard. This segment-exclusive feature offers independent left and right-rear-wheel toe angle control to enhance overall handling precision, low-speed maneuverability as well as high-speed stability. A host of premium features standard on the 2020 Acura TLX include the AcuraWatch™ suite of advanced safety and driver-assistive technologies, Jewel Eye® LED headlights, a 10-way power driver's seat, heated front seats, Smart Entry with push button start, and an intuitive dual-screen user interface (ODMD 2.0), with Apple CarPlay™ and Android Auto™ integration. 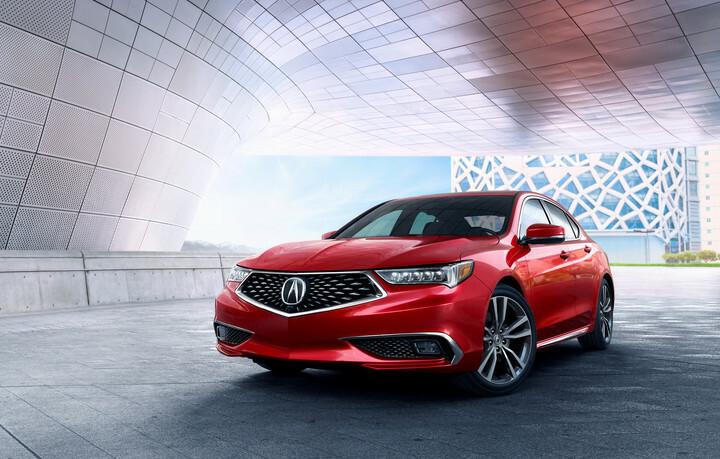 Available optional features include a 360-degree Surround View Camera system, heated steering wheel, next-generation AcuraLink® connected services and a 10-speaker Acura/ELS Studio® Premium Audio System. The TLX A-Spec, first introduced in the 2018 model year, continues to offer drivers a distinct, sport-themed appearance option, with A-Spec exclusive design elements inside and out. TLX A-spec features include a matte-black diamond pentagon grille surrounded by a dark chrome border, aggressive lower front fascia with broad center air opening flanked by round LED fog lights, and a dark appearance for the signature Jewel Eye LED headlights. A-Spec exclusive 19-inch alloy wheels finished in Shark Gray paint are wrapped with 245/40-series tires. 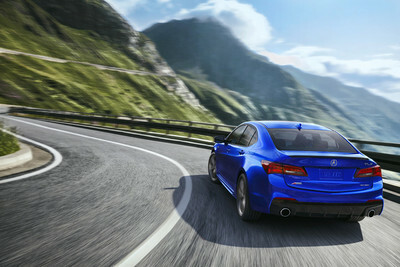 A-Spec exteriors include a rear gloss-black decklid spoiler, "smoked" LED taillights, an exclusive rear fascia featuring a lower diffuser accented by 4-inch round dual exhaust finishers and a matte-black side window surround. A-Spec badges appear on the front fenders and rear decklid. A-Spec models are available in several colors, including a trim exclusive Apex Blue Pearl. Inside, the TLX A-Spec features aggressively bolstered front seats with high-contrast stitching and piping, red LED ambient lighting, red driver's meter highlights, a black headliner and pillar treatment, brushed aluminum-look instrument panel garnish and pedals, and a thick-rimmed steering wheel with A-Spec badging. Two exciting interior themes are offered on A-Spec models; Black leather with black Alcantara™ inserts or a Full Red leather. 2 MSRP plus $995 destination charge, excluding tax, license, registration and options. Dealer prices may vary. 3 Based on 2020 EPA mileage ratings; Use for comparison purposes only; Your mileage will vary depending on how you drive and maintain your vehicle, driving conditions, and other factors.